In order to familiarize with the experience of local universities, clinics, as well as carrying out career guidance in the third decade of March 2019, a delegation of Osh State University headed by Vice-Rector for Development and International Relations, A.O. Abduvaliev visited India. 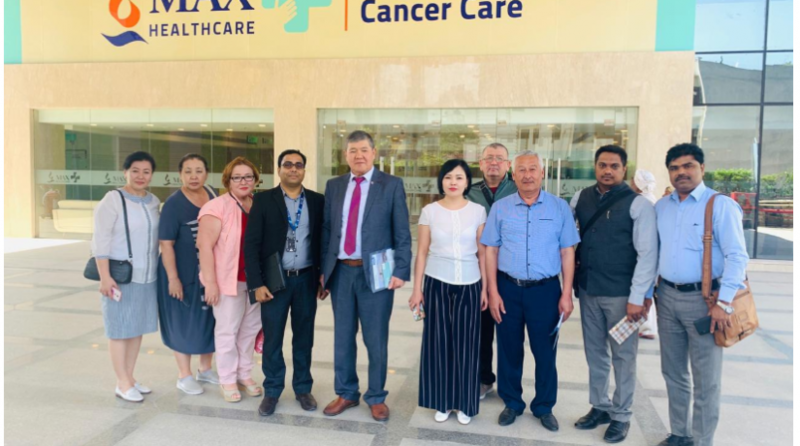 Two large cancer centers, such as MAX healthcare and JAYPEE in New Delhi, shared their experiences and provided an opportunity to familiarize themselves with the work of clinics. In addition, the delegation met the leading experts of hospitals with Dr. Vijay Kumar, Dr. Manoj Sinha, Dr. Gaurav Mahajan, Dr. Sunil Dhar, Dr. Pravas Chandra Mishra, Dr. Vicas Gosvani, Dr. Sovjanya Aggarval, Dr. Gagan Saini, Dr. Shailendra Kumar Goel. It turned out that the oncologic transplant doctor Dr. Vijay Kumar, cardiologist Dr. Vijay Kumar Manoj Sinha have been already in cooperatation with the clinics of our country and periodically comes in our university to exchange experience with the faculties and students. As a result, agreements were reached with the leaders of two large oncological centers in New Delhi. In the future, MAX healthcare and JAYPEE clinics expressed their willingness to cooperate and exchange experience with Osh State University. According to the agreements, our teachers will undergo internships, and students will practice in these clinics. In addition, at the invitation of our university, leading Indian doctors will come to give guest lectures.